Based on the amusing movie of the same name, Rango, starring the master of a million personalities, Johnny Depp, this movie-based game is actually one of the better creations of late and as we all know that movie games can sometimes be quite the stinker. 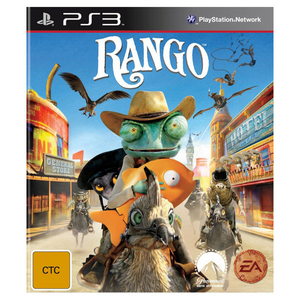 At its heart Rango is a competent action platformer that is aimed at the the younger gamer as they control the chameleon sheriff. Although it is not mandatory to have seen the movie to play the game, it does help you link better with this universe and more importantly, if you have not see the movie and want to see the film, the game may offer some spoilers. Unfortunately for our character, Rango has one vice, his big mouth that often gets him in trouble more often than not which is how he ends up being the sheriff within a town in the Wild West. Like the film, comedy plays an integral part to the game and there are some wonderful cutscenes thrown in for good measure. Our little green chameleon has some great one-liners littered throughout the game with many verging on amusing yet bad spaghetti western quotes. As mentioned, Rango is an action platformer which generally requires you to get from point A to point B and defeat anything that gets in your way. Add in a few basic puzzles, some boss battles and you have a solid game for the younger player. With that said, some older gamers will get a kick out of the game because it does harken back to a simpler time of classic gaming. Controlling Rango is quite easy via the DualShock Controller as you run around the gaming environment performing classic arcade moves like jumps and double jumps plus combat. Now if only double jumps existed in the real-world... wouldn't that be a sight to behold! Like all arcade games, there are plenty of things to collect in the game such as stars and space rocks. Combat plays a key part of Rango and our little chameleon has both melee and ranged attacks. Rango also has access to a gun that allows him to shoot his enemies and upon defeating an enemy, they are turned into stars which can then be collected and then used to purchase additional abilities. By smashing things in the environments, you are awarded even more stars that is a classic arcade archetype functionality. 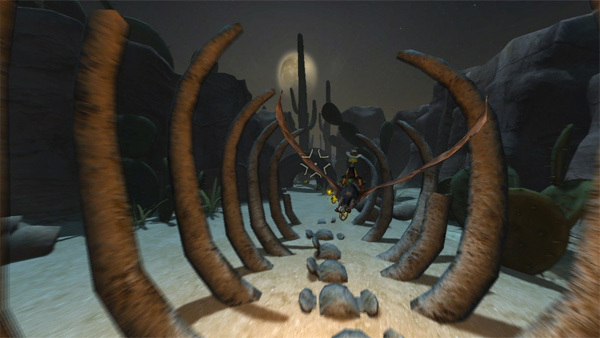 Combat is mixed up in the game with special areas and additional items that can be used for the short-term such as a super gun and a really cool scene where you ride an animal in the desert as you shoot your enemies. Add in some power-ups and a very fun special attack that involves a tongue and the combat in this game is actually quite diverse for an arcade platformer. If you do happen to get killed along the way, Rango offers quite a few checkpoints in the game so your frustration will generally be a moot point. 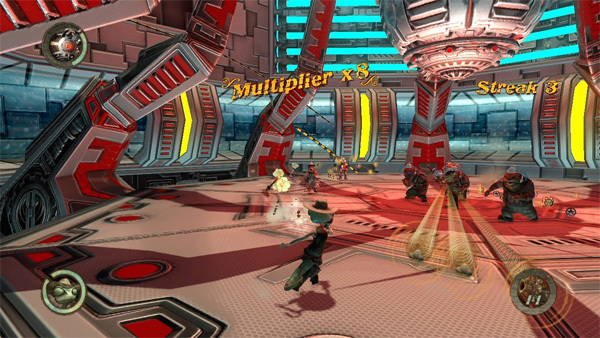 All in all, the arcade element of Rango works pretty well. The only problem is that we've seen it all before in other arcade games. 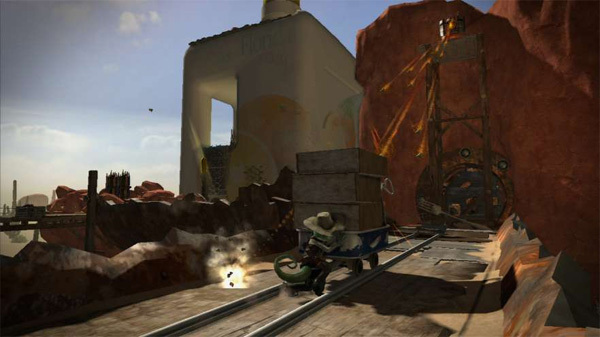 Graphically, Rango is a gorgeously designed arcade game. 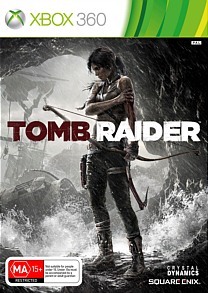 The main character looks identical to his CGI move counterpart, including all the other characters who grace the game. The backgrounds have been replicated to portray the movie and although the majority of levels are in the deserts, there is a little bit of diversity included such as the cool mine levels and some weird almost space-ship type level. Lighting is used well to make the graphics stand out and our FULL HD TV, Rango is quite a good looking game, especially the surreal level where our hero goes on an almost Indian type journey. There are a variety of enemies in the game such as zombie like creatures all characters move with an animated grace that suits the title perfectly. However, in some of the more detailed areas, there is some tearing in the game but fortunately it's nothing too serious. Sound and music compliment the graphics and the story well. Even though I was considerably older than the targeted audience for Rango, I actually enjoyed this quirky action platformer as I explored the Wild West with my smart alek yet at times cowardly and heroic chameleon. The game may not think outside the square in terms of originality but it does offer a very competent gaming engine with some lush graphics on the PS3. More experienced gamers can easily knock this game over in around 5 to 6 hours but if you want to explore more, you could add a few more hours to this. So put on your cowboy hat, put a straw in your mouth and start exploring the Wild West... younger gamers that is!